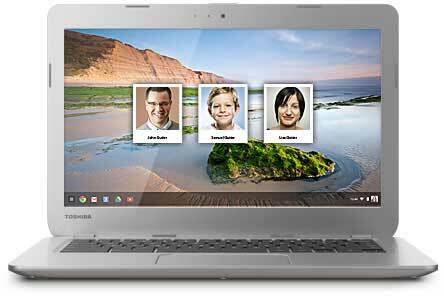 Meet the new Toshiba Chromebook—the first device of its kind to feature a 13.3-inch diagonal HD display. Powered by Chrome OS™, this Chromebook™ has everything you need, already built in. It boots in seconds. Has no annoying updates. Browses faster. 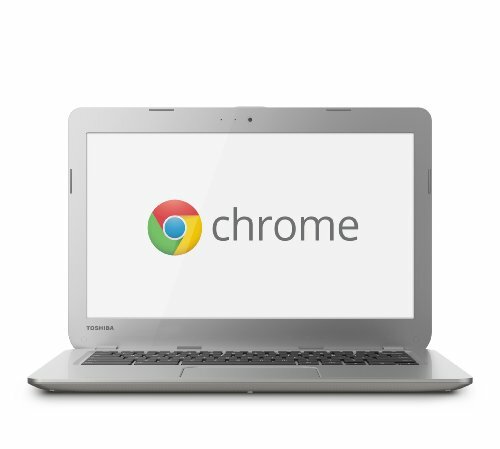 Sleek, lightweight and always up to date, the Toshiba Chromebook is an ideal choice for everyone. It is easy to use, easy to manage and convenient for everyday use. 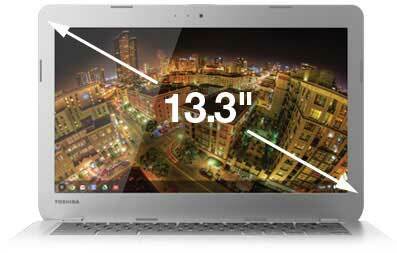 It’s the only Chromebook to deliver the best of the web on a gorgeous 13.3-inch diagonal HD TruBrite® screen. Offering more room for web browsing, document creation, video chatting and apps than a tablet and is better suited for productivity—just like a laptop. A full-size Chrome keyboard and spacious touchpad makes getting work done a cinch online with an increasing number of productivity-driven apps like Gmail™, Calendar, Docs and more that enable users to continue working even when not connected. 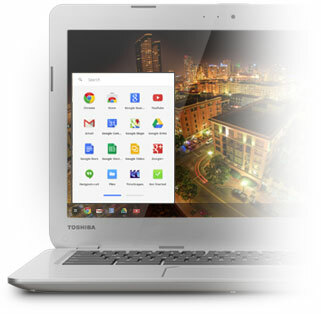 With up to 9 hours of battery life*, the Toshiba Chromebook is highly portable with a sleek and lightweight design. It weighs just 3.3 pounds and features a slim, less-than-an-inch profile and textured finish. Powered by the fourth generation Intel® Celeron® processor, plus 2GB of RAM and a 16GB solid state drive, it starts up in seconds and enables you to breeze through the web at lightning speed. *Actual battery life may vary. See info.toshiba.com for more information. Chromebooks are designed from the ground up with security in mind, to help keep you safe from viruses and malware without having to buy and install security software separately. They also update themselves automatically, for free. And you won’t have to purchase or install upgrades manually. Now that’s easy. Ideal for growing families, Chromebook features multi-user support so you can create a custom experience for each user. Just turn on your Chromebook, tap your photo and sign in to your own homescreen, apps, email, photos and storage. 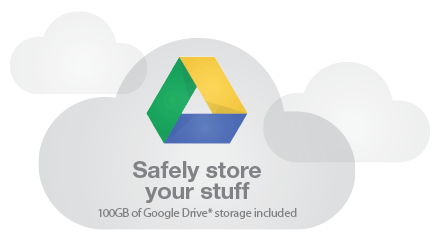 Built for the cloud, Chromebook lets you save and access your growing collection of files, photos and entertainment from your smartphone or PC, thanks to 100GB of Google Drive™ online file storage space included. *Offer subject to change without notice—see Google Drive™ terms for more details. Start drafting a Google™ Doc on your Chromebook and finish it on your tablet or smart phone. All your emails, files, photos, apps and bookmarks from your Chromebook are easy to access from your phone, tablet or PC. So your productivity doesn’t have to miss a beat. 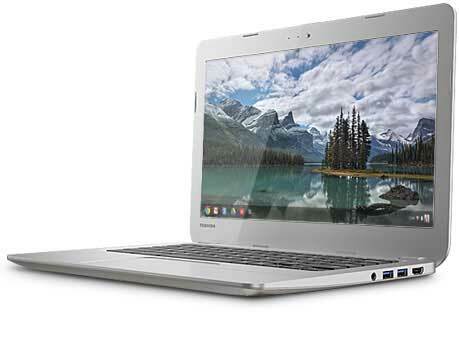 This Chromebook is also equipped with laptop essentials for greater usability, including two USB 3.0 ports, a full-size HDMI® port, security lock slot and a memory card reader, plus Bluetooth® 4.0 and dual-band 802.11 a/b/g/n Wi-Fi®. ©2014 Toshiba America Information Systems, Inc. While Toshiba has made every effort at the time of publication to ensure the accuracy of the information provided herein, product specifications, configurations, prices, system/component/options availability are all subject to change without notice. TruBrite is a registered trademark of Toshiba America Information Systems, Inc. and/or Toshiba Corporation. Chromebook, Chrome OS, Gmail, Google and Google Drive are registered trademarks or trademarks of Google, Inc. Intel and Celeron are registered trademarks or trademarks of Intel Corporation or its subsidiaries in the United States and other countries. All other trademarks are the property of their respective owners. All rights reserved.